Digital UNIX System Administrator's Guide is the first book to address Digital UNIX system administration from an experienced administrator's point of view. Every topic covered is specific to Digital UNIX, including installing and configuring the system; creating and managing user accounts; managing networking, printing and the Web; developing and implementing backup strategies; and tuning and troubleshooting. This book walks the novice Digital UNIX administrator through the initial system installation and is a guide through the main points of administering a Digital UNIX system. It also serves as a valuable reference guide for experienced UNIX system administrators who are new to Digital UNIX. It includes appendices that list URLs of valuable resources on the Web and detail useful public domain utilities and where to get them. About Digital UNIX: Digital UNIX sales grew by 51% last year, faster than the industry's UNIX growth. (Overall, high-end UNIX server sales gained 5% last year and midrange UNIX servers grew 34%.) Digital was the first to offer 64-bit architecture, which has caused Sun, HP and Silicon Graphics to follow their lead. The combination of Digital UNIX and Alpha technology provides extremely high system performance. Analysts say that UNIX has a good three to five year technology lead over Windows NT due to its scalability, reliability, and clustering ability. Senior UNIX System Administrator, Medical Archival Systems, Inc. (part ofUniversity of Pittsburgh Medical Center). Matthew Cheek is a practicing UNIXsystem administrator with experience in the telecommunications, healthcare,and manufacturing industries and has supported various flavors of UNIX since1988 and Tru64 UNIX since 1996. He is a frequent contributor to "SysAdmin",a monthly magazine for the UNIX system administration community. 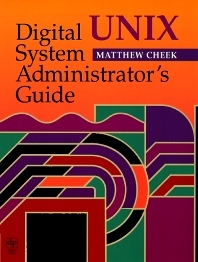 Matthew isthe author of "Digital UNIX System Administrator's Guide", also from DigitalPress. Senior UNIX System Administrator at Medical Archival Systems, Inc. (part of University of Pittsburgh Medical Center) and the author of Digital UNIX System Administrator’s Guide. Cheek has installed, configured, managed, and written about UNIX systems from a variety of vendors since 1988.